"If You Love Arts & Entertainment, You'll Love the Winter Issue of On Patrol"
Staff Sgt. 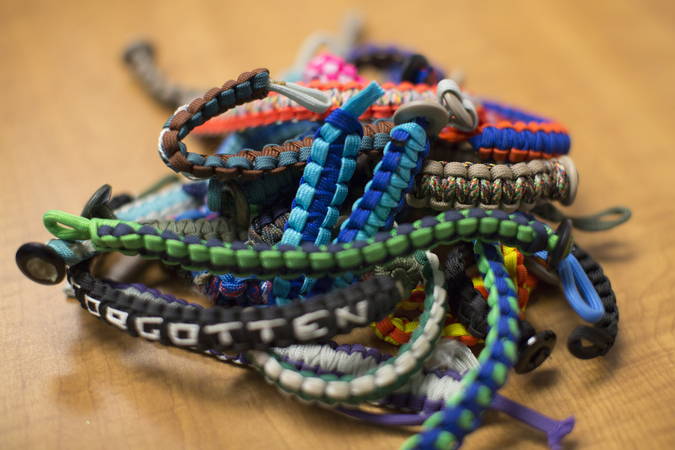 Megan Smith remembers the first time she made a 550 cord bracelet at USO Camp Buehring, Kuwait. 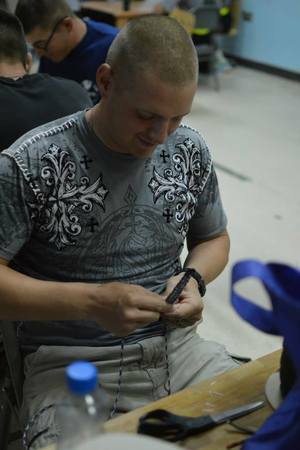 A service member crafts a bracelet. That was the point Smith, who also volunteers at USO Camp Buehring, realized why the activity was so special. 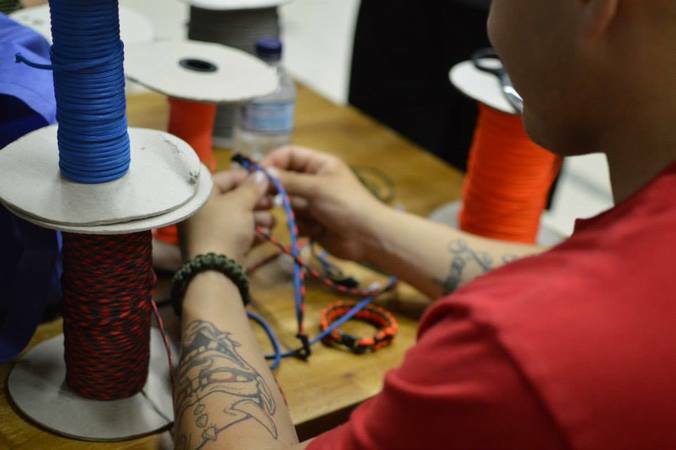 In the past few years, 550 cord bracelets – which are crafted from parachute cord – have gained popularity, creating a demand for bracelet-making classes at USO centers around the world. “Troops just love it,” USO Camp Buehring Volunteer Coordinator Christina Ambrose wrote in an email. 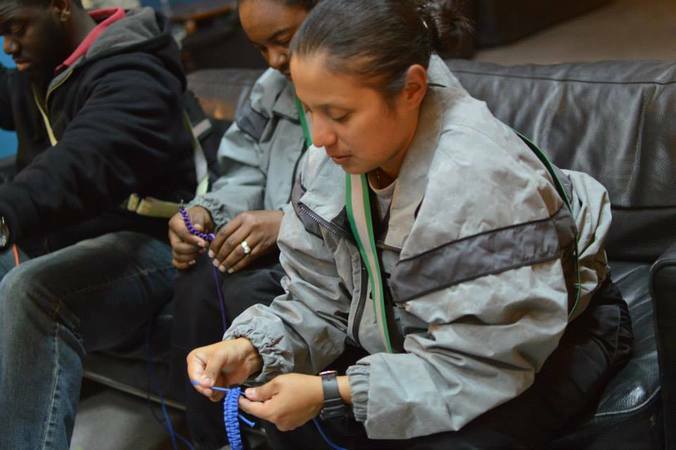 In Southwest Asia, where troops deploy without their families, 550 cord workshops have become a popular way for service members to relax, be creative and make gifts for loved ones. Troops select their cord colors. 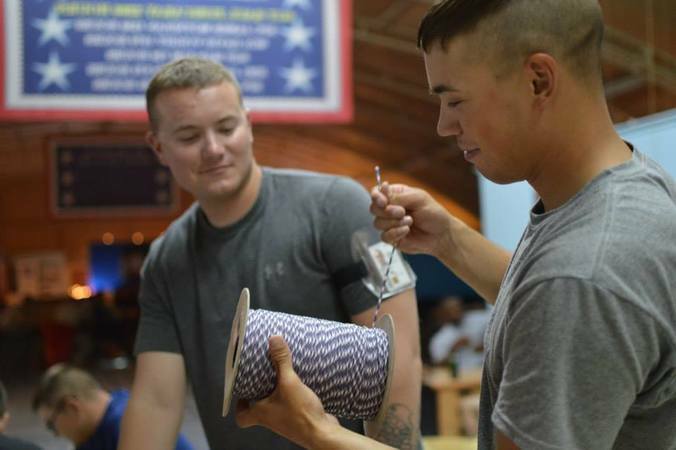 Service members craft bracelets at USO Camp Buehring. 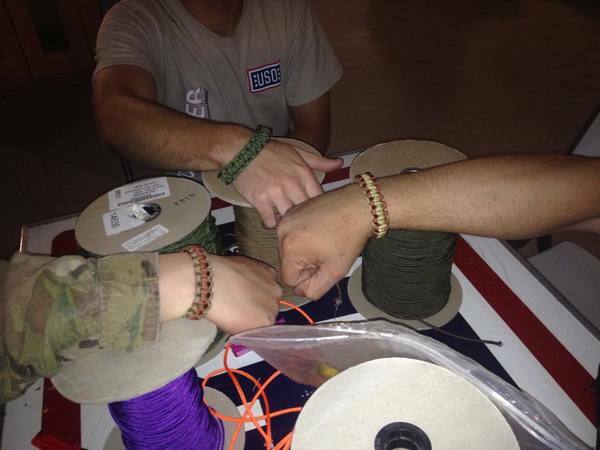 Service members show off their 550 cord bracelets at USO Bagram. Sarah Kemp’s 550 cord bracelets. Sarah Kemp shows off one of her treasured 550 cord bracelets. Sarah Kemp shows off one of her treasured 550 cord bracelets. The classes have also become a way for service members to stay busy and bond with comrades during long days away from home. USO centers offer a variety of different cord colors, buttons and clasps for troops to choose from. 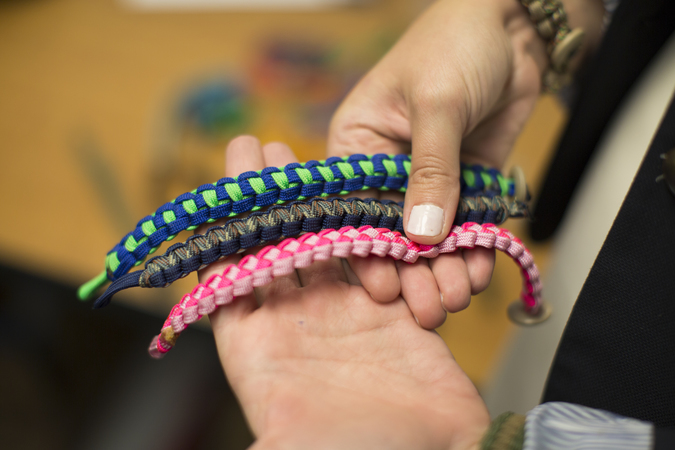 Service members can even create new ways to braid the cord to make their bracelets unique. “Troops get pretty creative teaching themselves new techniques,” USO Manager of Volunteer Relations Sarah Kemp wrote in an email. Your donations help us provide programs like this for service members around the world. Before it was braided into bracelets, 550 cord – also known as survival cord, paracord or parachute cord – was used to craft parachute suspension lines during World War II. Back then, paratroopers would cut the cord off their used parachutes and take it with them into the field to use for anything from securing equipment to vehicles to fashioning make-shift shoelaces. Many troops came to rely on the cord to craft tourniquets, make temporary shelters, hang clothes or catch fish in a survival situation. Today’s service members still use the same strong, semi-elastic nylon cord to perform a slew of field and survival tasks, perhaps explaining why so many choose to wear a 550 cord bracelet – which is made from about 10 feet of paracord – around their wrists. 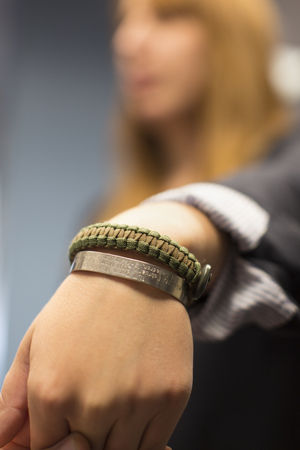 Click the image and watch our video for a step-by-step look at the process of making a 550 cord bracelet just like the troops at USO centers across the world. Part of the reason troops, and now civilians, find 550 cord so useful lies in the cord’s layered, woven design. One strand of military-grade 550 cord is made of seven inner strands of nylon cord, which, in turn, each contain three smaller strands of nylon cord. This system of layered cords not only makes the 550 cord strong enough to withstand 550 pounds, but also provides the user with a lengthy amount of cord to use in a variety of ways. "Each soldier has their own story about how 550 cord saved their backside once, I can guarantee it,” Smith wrote. The 550 cord has proven to be such a useful tool that NASA has included it as a necessary item on a number of missions and even used it to repair the Hubble Space Telescope in 1997. Although 550 cord bracelets can come in handy in a sticky situation, for many troops, wearing the bracelets is more about camaraderie and connection than preparedness. That’s why so many troops prefer handmade bracelets over buying them from retailers. According to Kemp, who has also worked as a volunteer coordinator at USO Kandahar in Afghanistan, many of the 550 cord bracelets symbolize deep emotional connections, important relationships or even fallen service members. “There are usually stories behind them,” Kemp said. One of Kemp’s most treasured bracelets, which she still has, was a gift from a soldier who made it at a USO class. The soldier wore the bracelet out on patrols while he was at a forward operating base. When he returned, he gave the bracelet to Kemp and told her it was his lucky charm. “The original colors were unrecognizable under the dust and dirt, but it meant so much,” Kemp said. 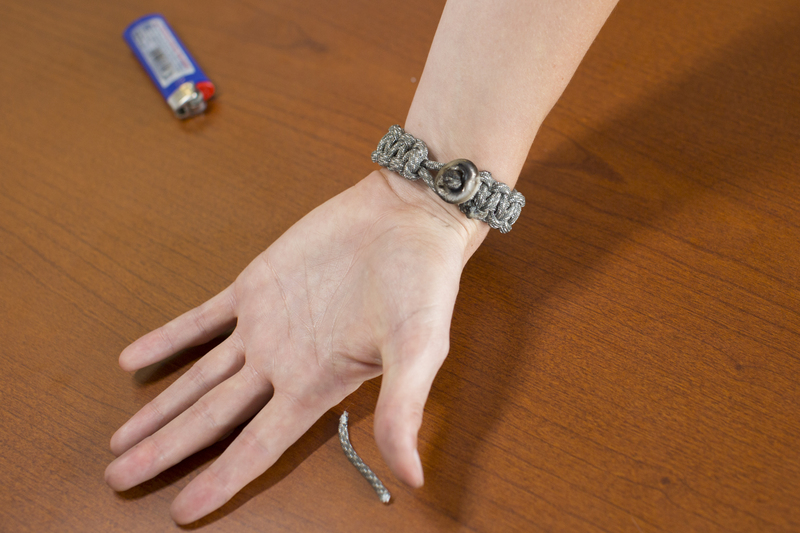 Want to learn how to make your own 550 cord bracelet? Check out our how-to tutorial here. For nearly 75 years, the USO has worked with entertainers and athletes to connect service members to the people and things they love. This is how the organization delivers hundreds of world-class experiences to thousands of military members around the world. “Why is dad so mad?” was a question Seth Kastle's daughters probably pondered every time their combat veteran dad got upset. So he wrote a children’s book to help his kids understand what he was going through. Thom Tran and his all-veteran group of professional comedians are committed to healing combat vets one belly laugh at a time. Just How Real is NCIS? The TV show's credibility has made it a global sensation and been a positive for the real agency that spent a lot of time explaining its mission before “NCIS’” 2003 debut. In an effort to keep spirits high, the USO created new ways to connect troops serving in Iraq and Afghanistan to their communities back home through video games. Entering its 10th year, the organization known for its weeklong film festival is also trying to bring moviegoers back to reality. The look and feel of this tintype photograph may trick your eyes into thinking it was taken during the Civil War, but don’t be fooled. It’s from present-day Afghanistan. Through dance, an Iraq War veteran is bringing the front lines to the front row. From the glitz and glam of the red carpet to a zombie apocalypse, Hollywood can deliver just about anything—except authentic military personnel, equipment or locales. That's where the Pentagon comes in. During World War II, Astaire—whose age, combined with the fact he had children, exempted him from the draft—lent his support by participating in war bond rallies and touring with the USO. When On Patrol reached out to artist and Air National Guard veteran Ed Drew for a magazine cover photo, we didn't know it would turn into a story about life, death and a friendship forged by service. Two artists - a sculptor and a painter - worked together to create compelling images as a way to connect their audience to veterans in their community. Former soldier talks about what it's like to play the types of USO shows he once watched from the crowd. This is how the USO and the Tragedy Assistance Program for Survivors worked together to support a military family during their darkest hours. When the seven-time USO tour veteran was inducted into the Baseball Hall of Fame last summer, the USO was one of the first names he mentioned. We asked Johnson why and here's what he said. At 5’6” and 132 pounds, two-time Medal of Honor recipient Sgt. Maj. Dan Daly was a small man, but he was also a pugnacious and fearless Marine.